There has been something worrying me for a long time regarding the global warming issue. The science is supposedly proven that the build up of CO2 in the atmosphere is the main cause of a roughly 0.6 degree increase in temperature since the beginning of the 20th century. We are told that the only way to allay this is to move to renewable energy sources and this now drives the politics, and to question this is becoming heresy. However what has been bugging me is just how much direct effect does man’s worldwide energy usage itself have on climate (if any) ? By this I mean that most energy produced by humans will eventually end up as heat whether it used for transport, industry or whatever else – and this is independent of how that energy is produced. So how much heat do we actually produce and does this have any effect at all or is it insignificant compared to radiant energy from the sun? It is my common experience that cities are allways hotter than the surrounding countryside sometimes by a few degrees. So I did the following back of the envelope calculation. If we assume that this energy consumption is concentrated in these urban areas then the human heating effect there works out at 5.5 watts/m2. Radiant energy from the sun is distributed unevenly on the earth’s surface but the average absorbed energy globally is 288 watts/m2 (This figure is taken from the book by Prof. Houghton “Global Change Briefing” ). This energy is then radiated from the surface as heat (infrared) and can be comparable to the human generated heating also at the surface. The greenhouse effect then just reflects some of this infrared radiation back to the surface (water vapour is the major greenhouse gas). Direct heating by Man in urban areas comes out at approximately 2% of direct solar radiant heating. These are just ball park figures and will depend on the latitude of the urban areas and their locations. 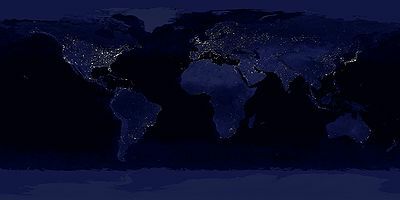 Also not all human energy consumption is generated in urban areas but counteracting this is the fact that most large cities are in high northern latitudes. The anthropogenic effect at night and in winter will be even higher. What temperature increase does this lead to ? We use Stefan Boltzman’s law. So the question is : Have I got this completely wrong (quite possible) ? If not then what effect does this have on the temperature measurements that are then used to track the climate ? This heating effect needs to be subtracted out from the global temperature averages to isolate the greenhouse effect. Weather station measurements near urban areas should be removed or corrected. Maybe they are already, but I have never seen reference to it before.